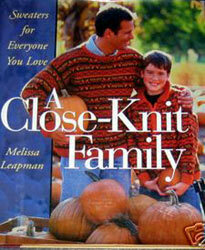 Most knitters create garments for someone else--usually a family member. With this beautiful collection of sweaters from knitwear designer Melissa Leapman, knitters will find projects to delight everyone on their gift list. Each chapter has a basic design that has been interpreted into different sweaters for adults and children. Instead of taking one sweater and changing the size, Melissa has created practical and different designs from a similar theme for each family member. By not merely reworking the same sweater in many different sizes, these projects will keep even the most prolific knitter engaged. The sweaters range in difficulty from easy to advanced, so every knitter will find a wide range of interesting projects. Each sweater has complete, easy-to-follow instructions.